Elevation: minimum 467 feet, maximum 941 feet. Area Habitat: open land 2.60%, forest 96.94%, wetland 0.39%, open water 0.00%. Deer: Open under statewide regulations for the archery, crossbow, December muzzleloader and youth gun seasons. Closed for October muzzleloader and modern gun deer seasons. Located 28 miles south of Louisville near Bernheim Arboretum and Research Forest and the Camp Crooked Creek Boy Scout Camp. It is east of I-65 and south of Clermont, and may be accessed from the west via Pioneer Drive and Crooked Creek RD east of KY 61 and via KY 733 from the south. Boundaries are marked with State Forest and WMA markers as well as red blazing on trees. There are currently 3 small parking areas, two of which are on the right (south) side of Crooked Creek RD; the first is near the entrance and the second is further down across the creek (there may be running water present, use caution if attempting to cross). The third parking area is at KY 733. An information kiosk (board) is at the first parking area. There is a turnaround at the end of Crooked Creek RD. The best hunting opportunities are deer, turkey, and squirrel due to the extensive (about 1500 acres) oak-hickory woodland. There are some fields on the area (about 45 acres) along Crooked Creek RD so rabbit or quail hunting may be fruitful. The area is open under statewide regulations for all hunting and trapping seasons, except firearms may not be used to take deer. Trapping is by permit only (call 502-477-9024 to apply). Do not park in the road or on roadsides; park in one of the three designated areas only. 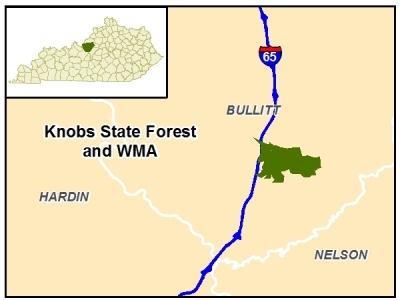 There are no ponds or lakes on the Knobs State Forest & WMA so fishing opportunities are restricted to Crooked Creek, which is intermittent (it dries up periodically). Thus fishing is not recommended. Owned by Kentucky Division of Forestry and Kentucky Department of Fish and Wildlife portions purchased with funds from the Heritage Lands Conservation Fund.